For Administrators, decide which apps are needed in your Method account. When you first install Method, you will get the default packs given to every Method account. However, you may not need all the apps given. In this article, we will give a short introduction to how Method works, describe the difference between Packs and Apps, and show you how to remove and add apps. When you first log in, you will be taken to your dashboard. The coloured boxes are called Apps. 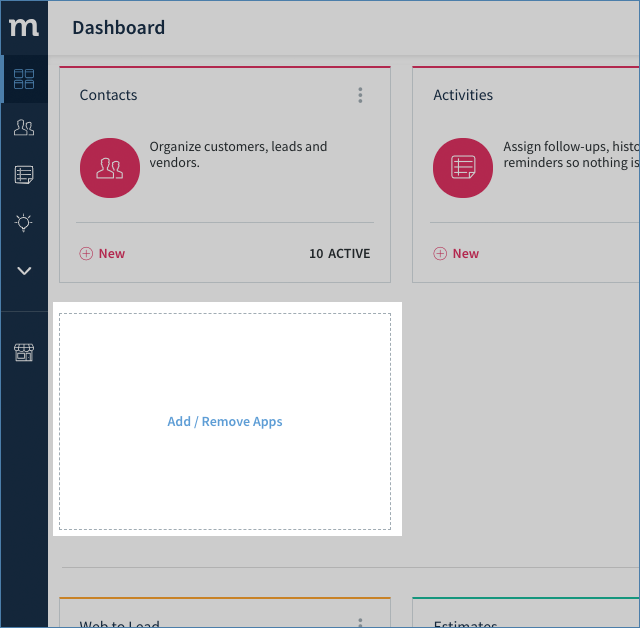 Each app has a specific functionality, for example, the Contacts app handles all your contacts, customers, vendors, and employees. Let's review the default installed packs and you can choose to keep them or not. 1. On your dashboard, select Add / Remove Apps. At the bottom of the page, you will see Installed App Packs. These are all the Packs currently installed in your Method account. 2. Select the Contact Management Pack. This will bring you to a page will allow you to manage the permissions of the Contact Management Pack. However, there is a way to manage all the permissions of each pack for your user on one page, so we'll navigate there. 3. Under User Summary, find your user name and select it. In the below example, I'm selecting Errol Elumir as the user. 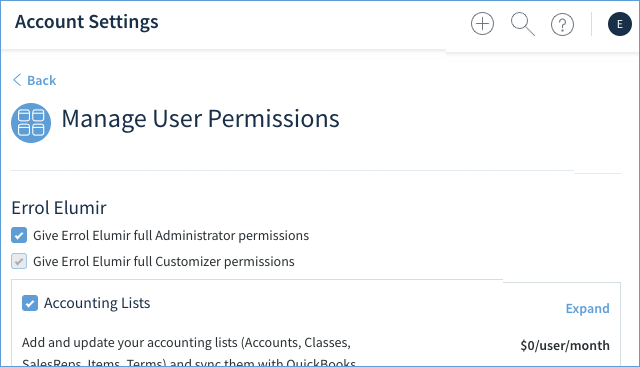 This will take you to a screen listing the permissions for the user you selected, which should have been your admin user. On this page, you can look at permissions at both the pack and app level, and you can turn access on and off. 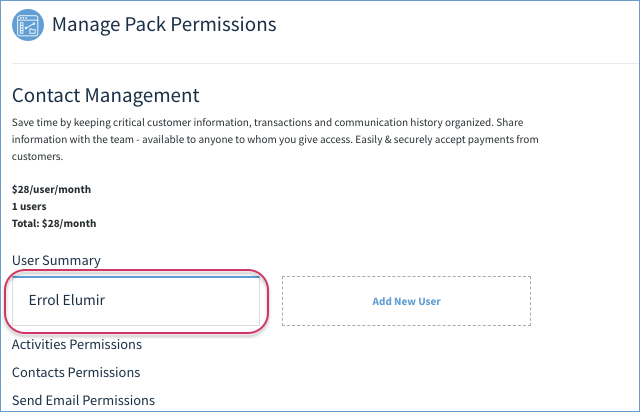 On your Manage User Permissions page, you will see a listing of all the packs you have subscribed to. Beside each pack, you will see an Expand link. Clicking it will show you the apps inside each pack. By unchecking the checkbox beside the pack name, you will remove the user's access to the entire pack. Note that when you do this, all the apps inside of the pack have all their permissions removed. However, by selecting the Access checkbox for each app, you can choose to remove access to individual apps. These apps will no longer show up on your dashboard. Note: Subscription cost is on a per pack basis. Even if you use only one app, you still have to pay for the pack for the user. Once your remove access for all apps in a pack, then you will not be charged for that pack for that user. Let's go through the default installed packs when you first install Method:CRM. From here, you can choose to remove access to the whole pack, or individual apps, as described above. Activities - Track your interactions with your contacts. Contacts - All your Customers, Vendors, and Employees which syncs from QuickBooks. 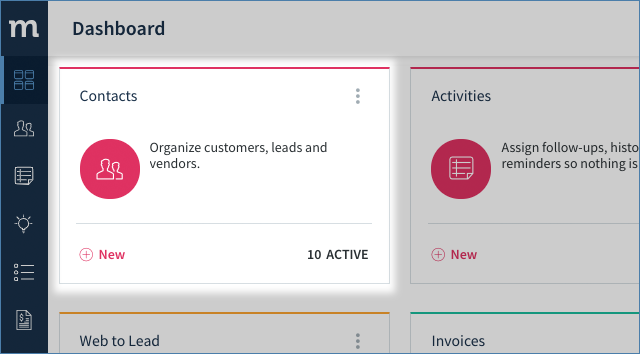 Also has customer leads, potential customers, which are kept from syncing to QuickBooks until you convert them to a customer. Send Email - Used by users and even other apps to send email, and also allows you to edit email templates. Opportunities - Each source of potential business is called a sales "Opportunity". This app will keep track of your opportunities as well as provide reports to display information on your ongoing and completed sales deals. Web to Lead - This app is used to set up a web form to be embedded on your web site so you can capture leads on your site and have them directly entered into Method. Sales Orders - QuickBooks Online does not have Sales Orders, however the app is still available. The sales order transactions created in this app will not sync to QuickBooks Online. Once you have decided on which packs and apps you need, hit the Save button to save your preferences. Note, you can do this exact same process for users you invite to Method.